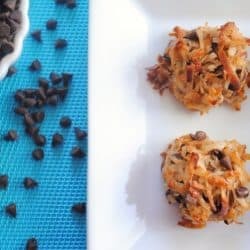 This recipe is my way of making up for my childhood years where I didn’t like coconut. Actually, I don’t think ANY kid likes coconut, do they? I now understand it’s charm and adore it, and take advantage of children’s distaste for it. Every year at Halloween, I buy a big bag of Almond Joys “for the trick-or-treaters,” as well as other candy. We pass out candy by holding out the bowl and letting the kids pick which piece they want. Shockingly – at the end of the night, we’re left with a big bowl of Almond Joys. Then I’m forced to eat them. It’s a curse, I tell ya. This coconut risotto satisfies my coconut craving all year around – it is full of coconut flavor from both shredded coconut and coconut milk. The rich color comes from vegetable stock. Omit the shrimp, or substitute tofu and you have a vegetarian bowl of goodness. 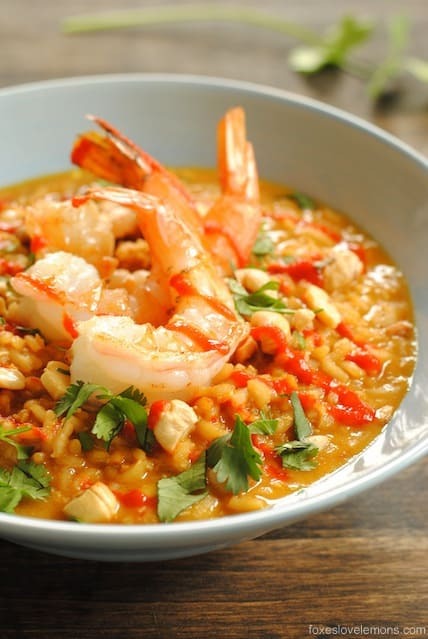 Get ready – this risotto is really spicy. Unable to decide between sriracha (which I love) and sambal oelek (which I double love), I just went ahead and put them both in there. Cut back on the sambal for a less spicy dish. 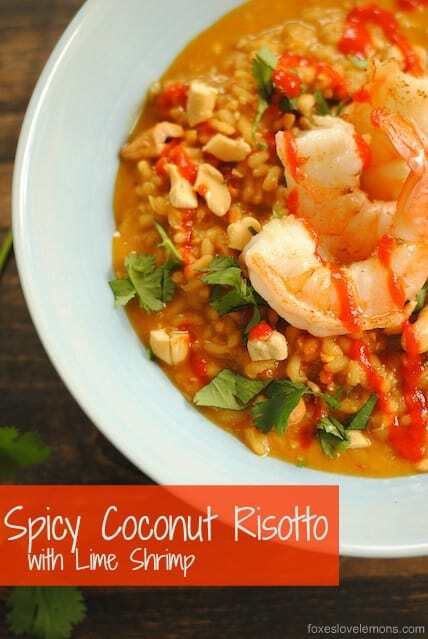 With it’s mix of sweet, spicy, nutty, herby, limey and shrimpy, eating this made me think of Pad Thai. 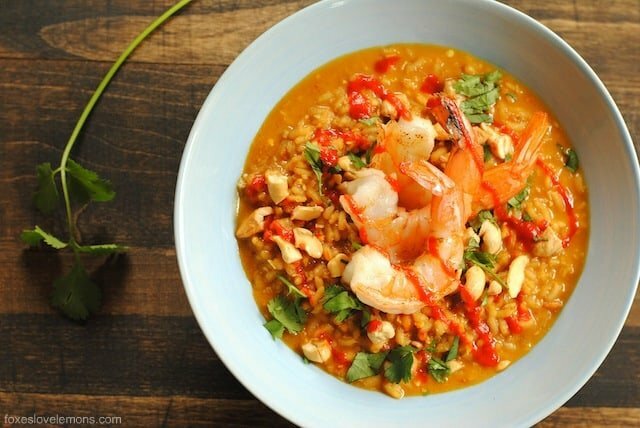 Call it Pad Thai Risotto if you’d like, and enjoy! Just be sure to have a glass of ice water on hand for the mouth burn that is about to ensue (hurts so good). In a small covered saucepot, heat vegetable stock over medium heat. When simmering, turn off heat and keep covered. In large high-sided skillet, heat butter over medium-high heat. Add rice, shredded coconut and ginger. Cook 2 to 3 minutes or until rice begins to become translucent at edges of grains, stirring constantly. Add 1/2 cup hot stock; stir constantly until mostly absorbed. Add additional stock in 1/2 cup increments, stirring after each addition and cooking until stock is mostly absorbed before adding more. Cook 20 to 25 minutes or until rice is tender, stirring frequently and adding stock as needed. Stir in coconut milk, sambal oelek, salt and pepper. Meanwhile, prepare Lime Shrimp: Heat butter in large skillet over medium-high heat. Add shrimp and cook 4 to 5 minutes or until opaque throughout, turning occasionally. Add lime juice; toss to combine. Divide risotto between warm pasta bowls. Top with shrimp and garnish with cilantro, cashews and sriracha. Yum this reminds me of the soup I was addicted to in Thailand, just a risotto version of it. Looks amazing and perfect for the cold chilly weather the southern hemisphere is currently experiencing. Thanks Brook! It reminded me of a Thai soup as well! Thanks Suzanne! What about Mounds? With the dark chocolate? Ohhh yeahhh! Oh yes, can’t forget about mounds!! I love anything with coconut. OMG, love risotto, especially with a little lime in there. Can’t wait to try this bad boy. I need to introduce you to my 7 yr old daughter. I buy a 12-oz bag of Bob’s Red Mill coconut flakes about once a month…she eats it by the handful! I don’t think she’ll be a fan of this recipe (not a shrimp eater), but I can’t wait to make it for the wife and I! So good! 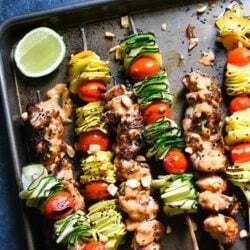 I just made this for dinner with a few whoops!-I-don’t-have-that adjustments, and it was amazing. One of the better meals that I’ve made in a while. Thanks for the recipe! I made this tonight with my boyfriend and it turned out great. I like adding more flavor so I increased the amount of ginger and pepper. Don’t increase the sambel oelek because it is truly spicy. When you cook up the shrimp add in another 1/2+ cup of the coconut so it turns into coconut shrimp! Also garnished with diced tomato. So good! 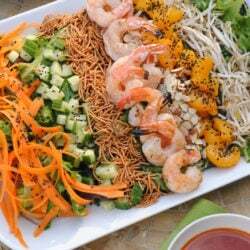 Love the idea of adding extra coconut to the shrimp, Kim. So glad it turned out well!